Finished The Legend of Spyro: The Eternal Night and wondering when you're going to find out what happens next? Well wonder no longer. Velvet Octopus, involved with the upcoming Legend of Spyro film, have posted the first information about the third entry to the trilogy. Other platforms aren't mentioned but I wouldn't cross them out just yet. And even though this will wrap up the Legend of Spyro story they also go on to mention that annual releases of Spyro on all major gaming platforms in 2009 and beyond are planned. UPDATE: Called "Legend of Spyro: Darkest Hour"? EBgames, they list PS3, PS2, Wii, Xbox 360 and DS versions of the game. 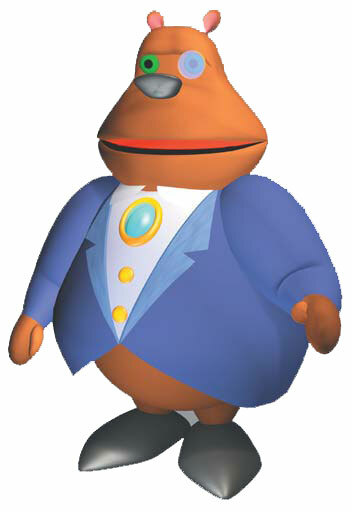 Thanks go to Vitani333 on SpyroForum and Neal from SpyroWorld. Spyro's Lair has now finally fully opened; you can now create your own customised little dragon, chat with others in the Lair using a set of predefined sayings and complete activities for points. To help show off your creations I've made a simple Dragon Generator that you can use to recreate your dragons from Spyro's Lair and share them with the world. It's done. 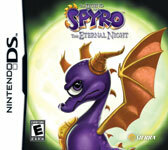 The complete walkthrough to the console version of The Legend of Spyro: The Eternal Night. It's so big it's split into two smaller bits that aren't very big. Also included are the Enchanted Scriber's Quill Locations as well as the locations for all of the Relics, both Health and Magic. And for those of you who've beaten the story, there's also a guide to the Dragon Challenges. 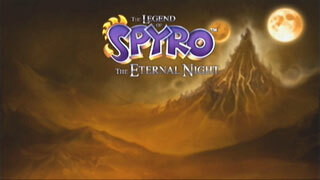 Also, today finally sees the release of The Legend of Spyro: The Eternal Night on the Wii in the UK. So that's good. For those of you playing, and stuck on, the Game Boy Advance version of The Legend of Spyro: The Eternal Night, this may be of use to you. I've completed a full walkthrough to the game along with a guide to all of the locations of the many relics hidden throughout the game. 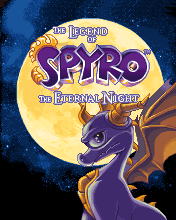 Apparently the mobile version of The Legend of Spyro: The Eternal Night was awarded the Best Mobile Video Game Award at the second annual Video Game Festival, in Montreuil, France. "We are extremely excited and honored that our game, The Legend of Spyro: The Eternal Night was awarded the coveted Best Mobile Game Award by the Video Game Festival," said Paul Maglione, president of Vivendi Games Mobile. Due for release in November, you can find several new screens of the game in the Gallery. The Legend of Spyro: The Eternal Night mobile game gives players the chance to guide Spyro through 13 graphically stunning levels, specially adapted for mobile phones. 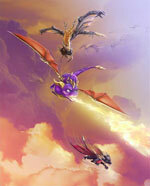 The mission is to collect the four elemental powers that will enable Spyro to halt the resurrection of the Dark Master. As Spyro’s powers are gradually unlocked, players will uncover the mysteries of the bizarre universe and the many enemies that populate it. You can now also find a short demo of the game on The Mighty Troglodytes' website. GameSpot now have the first official gameplay video of The Legend of Spyro: The Eternal Night available on their website. It shows off the new moves in the game, including the brand new 'Dragon Time'. As well as that they've got some brand new screenshots there for the Wii, PS2, DS and GBA versions. You can also find a couple of GBA videos here on the Gallery page. As you would pretty much expect, Vivendi Games Mobile have now announced that they will be releasing a mobile phone version of The Legend of Spyro: The Eternal Night. A sequel to the award-winning The Legend of Spyro: The New Beginning mobile game, this time around Spyro has eight enemy bosses to overcome across 13 levels of intense action. Spyro’s ultimate objective is to prevent the resurrection of the Dark Master; a task to which he rises with typical dragon valor. Due to be released on the 12th of November, you can also see a couple of screenshots which you can find in the new Gallery for the game. It's also worth noting that this is the first time that The Eternal Night has been mentioned in an English language Press Release by Vivendi. Another year rolls on by and darkSpyro gets another year older quite coincidentally. Over the last year we've had over 4 million hits and passed the milestone of 20,000 posts. Hopefully in the year to come I can finish, polish, and rewrite the current guides, rewrite a lot of the website's code, get the new Guidebook started and get some new features available for registered members and guests alike. For no other reason than that I had access to a load of Spyro related images, I've added brand new galleries and brand new images to already existing galleries for several of the games. We've got additions for Spyro: Enter the Dragonfly, Spyro: A Hero's Tail, Spyro: Fusion, Spyro: Adventure, and Spyro: Season of Ice. Apologies for the lack of post worthy updates since the end of November last year but here's one. I have today finished off and posted my brand new and complete walkthrough for the mobile version of The Legend of Spyro: A New Beginning. Only got the DS version of the game left to write a walkthrough for now. The game, The Legend of Spyro: A New Beginning, has been out for over a month now and I've completed work on my walkthrough for it. Also added to the The Legend of Spyro: A New Beginning section are a cheats page (with one cheat two cheats) and a page where you can randomly generate Enemy Names. Players of the Nintendo DS version of the game might like to know that I have also posted solutions to all eighty of the Power Crystal Puzzles, though that was added a little while ago. And for those of you who don't have the game but are still deciding whether or not to, I've collected a load of reviews together onto one page with links to the full articles if available so that you can judge based on other people's opinions of the game. In other Spyro content news, I have finally finished adding all of the characters from Spyro 2: Gateway to Glimmer to the Character Guide. Today marks the day that The Legend of Spyro: A New Beginning officially goes on sale in Europe, though it was actually released slightly earlier in the week. And for those of you wondering when I'd write a walkthrough for the game, wonder no more. Well, keep wondering for the most part but don't wonder about the GBA version no more. That's right, you can now get through the Gameboy Advance version without any trouble by using my walkthrough which covers the entire game. It's been a strangely silent front with screenshots for the GameboyAdvance version of the game, you'd almost think that it didn't even exist. 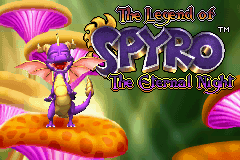 However the first five screenshots of the side-scrolling GBA version of The Legend of Spyro: A New Beginning have appeared on the Australian website of Nintendo. Also worthy of note are the first screens of the Mobile version of the game which you can find at the Italian mobile games website WirelessGaming.it. Thanks go to Spyro-Fan and Michael respectively for finding these. I've completed work on my brand new walkthrough for Spyro: Shadow Legacy. It walks you through the entire game from start to end and all the stuff inbetween. All items, eggs, relics, crystals and creatures are listed and is viewable in both the basic TXT format or an HTML format. In celebration of one of the most pointless things to know about the site, for the 800th day of darkSpyro I have updated the forums and the site in general. The news section of the site has had a slight revamp, with 'categories' for finding news posts about each game (all colour coded of course) and a very slightly altered comments system which makes use of some of the forum changes. You might also notice a load of URL changes elsewhere on the site but they're not really that important to users. The forum itself has got what it's had before, lost, then had again before being snatched away quickly. Yep, avatars. Amazing huh? Several fixes are also included including a change from html code to the equally similar BBCode which itself includes a quoting feature. And registered users can now also see exactly what they have previously rated all of the games from within their profile. Oh, and here's another preview of The Legend of Spyro: A New Beginning from Computer and Videogames with some new screens. Thanks go to GnastyRatchet for finding it, of course.